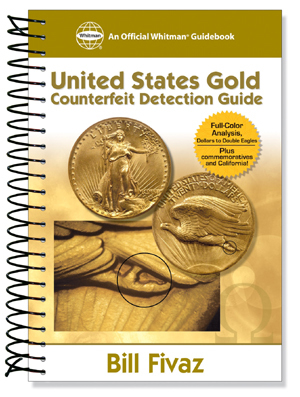 Whitman's United States Gold Counterfeit Detection Guide is a full-color, 224-page reference for identifying fake gold coins, from dollars to double eagles. Detailed text and high-resolution close-up photographs show specific diagnostics for nearly 200 frequently encountered counterfeits. California fractional gold and commemoratives are also studied. The text includes expert advice from professional graders, authenticators, and dealers; more than two dozen "rules of thumb" (with illustrations); a glossary; an appendix of genuine U. S. gold coin specifications and tolerances; and another appendix of physical traits of genuine gold coins, with photo close-ups. The United States Gold Counterfeit Detection Guide is the first book of its kind for U. S. gold collectors, and promises to be a standard reference in the field. Full color throughout; illustrated; 224 pages. By Bill Fivaz; foreword by Randy Campbell. This is a must have book for anyone collecting or investing in U.S. gold coins!